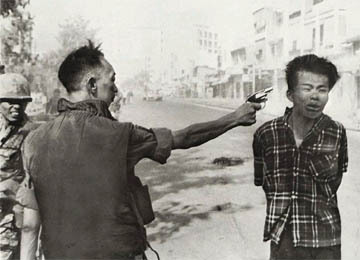 The Pulitzer Prize-winning photo of a communist guerrilla being executed in a Saigon street during the Vietnam War. Eddie Adams, a Pulitzer Prize-winning photojournalist and combat photographer who produced one of the most riveting images of the Vietnam War, died on Saturday in Manhattan. He was 71. The cause was Lou Gehrig's disease, or amyotrophic lateral sclerosis, said Judy Twersky, a spokeswoman for the Eddie Adams Workshop. In a 45-year career, much of it spent in the front ranks of news photographers, he worked for The Associated Press, Time and Parade, covering 13 wars and amassing about 500 photojournalism awards. But it was a 1968 photograph from Vietnam, taken for The A.P., that cemented his reputation in the public eye and among his peers. That black-and-white image captured the exact moment that Brig. Gen. Nguyen Ngoc Loan, then serving as the national police chief of South Vietnam, fired a bullet at the head of a Vietcong prisoner standing an arm's length away on a Saigon street. Although there was little doubt that the captive was indeed a Vietcong infiltrator, his seemingly impromptu execution shocked millions around the world when the photograph was first published and it galvanized a growing antiwar sentiment in the United States. Mr. Adams took the image during the Tet offensive, when the Vietcong began attacks within Saigon, the capital of South Vietnam. The picture received the Pulitzer Prize for breaking-news photography in 1969. Together with Nick Ut's 1972 image of a naked girl fleeing her napalmed village and Ronald L. Haeberle's color pictures documenting the 1968 My Lai massacre (which were first published in Life in 1969), Mr. Adams' photograph reinforced a widespread belief that the South Vietnamese and American military were doing more harm than good in trying to win the war against an indigenous insurgency and the North Vietnamese army that sponsored it. This interpretation long dismayed Mr. Adams, who accepted Brig. Gen. Loan's contention that the man he shot had just murdered a friend of his, a South Vietnamese army colonel, as well as the colonel's wife and six children. "How do you know you wouldn't have pulled the trigger yourself?" Adams would later write in a commentary on the image. Like other combat photographers of the time, including Larry Burrows, David Douglas Duncan, Henri Huet and David Hume Kennerly, Mr. Adams devoted most of his efforts to sympathetically depicting the pain and suffering of American and allied ground troops, just as W. Eugene Smith had done earlier. As a military veteran, he sought to portray the Vietnam experience from the viewpoint of the grunt, or platoon solider. But none of his war images achieved the renown of the execution scene. Edward Adams was born on June 12, 1933, in New Kensington, Pa., the son of Edward and Adelaide Adams. While in high school in New Kensington he joined the photography staff of the school newspaper, and after graduation he enlisted in the Marines and served for three years as a combat photographer in Korea. He later worked at The Evening Bulletin in Philadelphia from 1958 to 1962, and then joined The A.P. He worked for Time from 1972 to 1976, but returned to The A.P. as a special correspondent. It was in that capacity that Mr. Adams embarked on a story about the Vietnamese boat people, refugees who had set out seeking asylum in neighboring countries. Instead, they were turned away from shore and often robbed by pirates. Mr. Adams boarded one of the boats being towed away from Thailand; he found 50 adults and children packed onto a 30-foot craft. The pictures that resulted were widely published and then presented to Congress by the State Department. According to Mr. Adams, his images helped the government decide to admit as many as 200,000 South Vietnamese to the United States. "I always tell photographers that you never know who is looking at your pictures or how your pictures are going to affect other people's lives," Mr. Adams later observed. "I wasn't out to save the world. I was out to get a story." For the last 20 years Mr. Adams worked as a special correspondent for Parade, the weekly magazine that appears as a supplement in many Sunday newspapers. He also participated in several projects in the "Day in the Life" book series, including most recently "A Day in the Life of the United States Armed Forces," published in 2003. 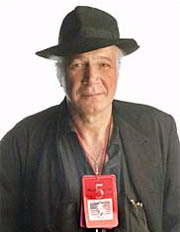 In addition to photojournalism, Mr. Adams took photographs for clients in the fashion, entertainment and advertising industries. In 1988 he started the Eddie Adams Workshop as a training ground for aspiring photojournalists. Held annually for four days in the fall in Jeffersonville, N.Y., the workshop has enlisted well-known photojournalists and picture editors as faculty, including figures such as Joe Rosenthal and Gordon Parks. The workshops are expected to continue, Ms. Twersky said. Survivors include Mr. Adams's wife, Alyssa Ann, and their son, August Everhett, of New York; his mother, Adelaide Adams of West Palm Beach, Fla.; his sisters, Lorraine Cornwell, Darlene Schimmelfanick and Beverly Klemzak, also of West Palm Beach, and Joanna Holka of Mantua, Ohio. He also is survived by his wife from a previous marriage, Ann, and their children, Susan Sinclair and Edward Adams, both of Atlanta, and Amy Adams of Montclair, N.J.
Mr. Kennerly, the photojournalist, said that Mr. Adams's picture of the execution is "one of about five great photographs of the 20th century that really changed history."